We are into Day 12, so only 5 days left until we reveal the fantatic surprise on Launch day with series 9 moshlings. Chirpy has hopped off, and today we have Tessa the shooting star twinkling into view. They are always at home with a bit of moon dust and goopernovas. However, they don’t like their skies cluttered up with space junk or being mistaken for Twistmas decorations; which I suspect happens rather a lot. 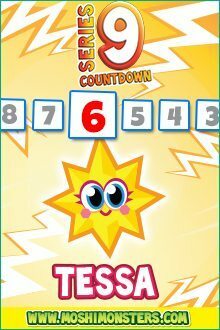 Day 13 is unlucky for some, but not for you as we reveal the next moshling after Tessa in pour series 9 countdown, don’t forget to subscribe to the blog so you get the news as it happens!